Brisbane City Council earlier this month. 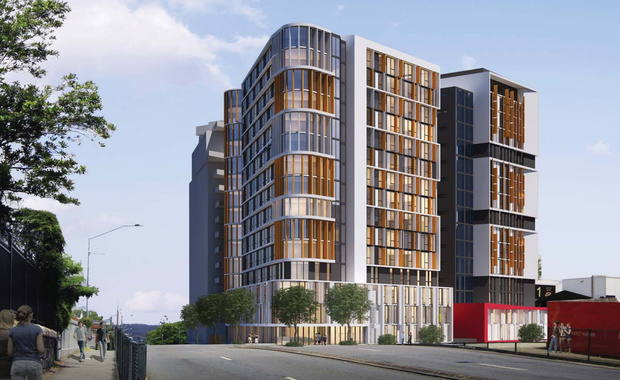 The proposal at 190 Vulture Street comes just one week after Brisbane Lord Mayor Graham Quirk announced a subsidy to create purpose-built and centrally located accommodation for students. The temporary three-year reduction would reduce infrastructure charges for student accommodation developments within a 4km radium of the Brisbane GPO. "There is continued growth in demand for international students and we want to promote international education which is Brisbane's biggest export but also expand options for domestic students seeking quality accommodation," said the Lord Mayor. "It is about taking the pressure off student accommodation chewing up housing stock in the suburbs. "If approved, it would mean the applicant, Australia Education (Holding) 2, could receive a multi-million dollar discount in fees from both the Brisbane City Council and Queensland Urban Utilities. Council planning officers will now assess the application before forwarding onto councillors for final approval.